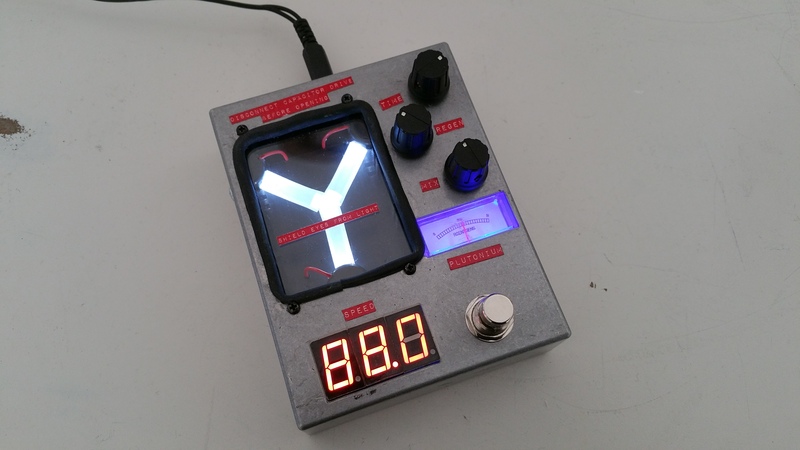 The flux capacitor delay pedal! 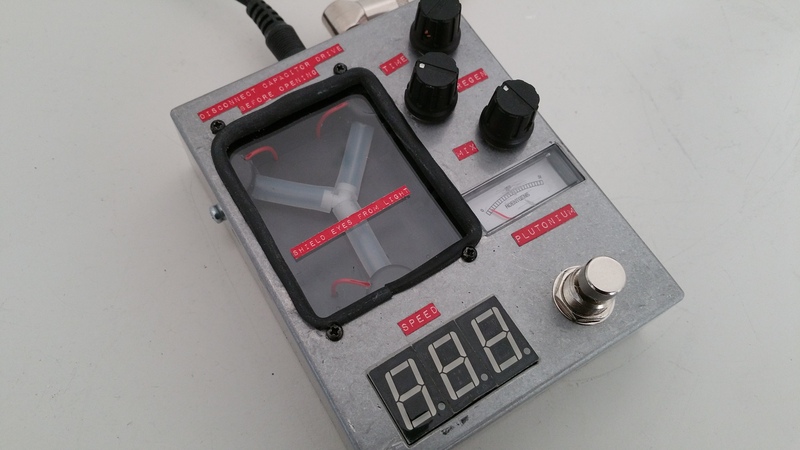 Home » Effects Pedal Gallery » The flux capacitor delay pedal! Hi guys – well here it is … the pedal that’s made it all go crazy! I’ve added this page so you have some info and a link to order one. Please take the time to read everything below before ordering. So it’s a lovely sounding analogue-style warm delay, but who cares, it’s got a glowing flux capacitor, that kicks in when you turn the delay on! The pedal takes standard 9v centre negative and the current draw is around 70ma. As with all my other pedals, I would recommend the use of an isolated power supply to avoid any noise issues. The dimensions of the pedal are 120mm deep by 90mm wide. I’m just one guy who builds pedals in a small workshop in his house. I never expected this little pedal to go viral. I built the unit you see pictured for myself. Yep I thought it was pretty cool and a few people in the UK might share it, and I might sell one or two. I’m overwhelmed by how many enquiries I have to build one. To give you an idea, I usually build around 4-5 pedals a week, on a good week. Yesterday (25th Feb 2015) I got over a hundred enquiries to build one of these! I’ve set up this page as an easier way of ordering one. The Paypal button should let you easily order a pedal. What I can’t guarantee at present is a delivery time estimate. I’m making them one-by-one and cutting / drilling / wiring everything by hand. 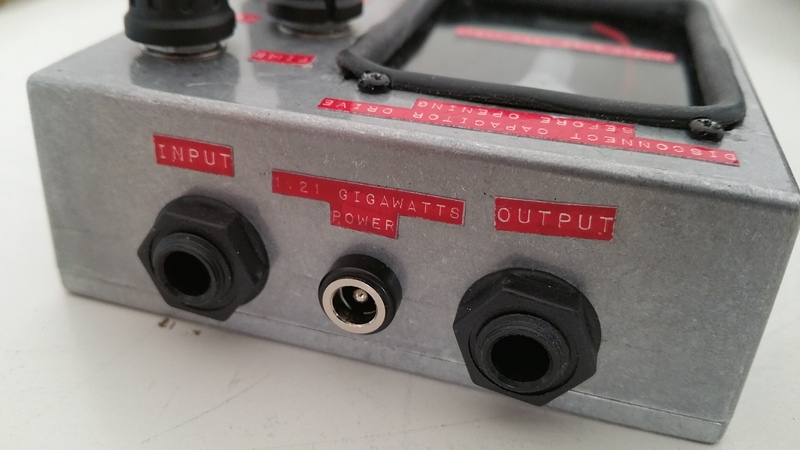 If enough orders come in, I will look at getting the enclosures laser-cut to speed up the process. I would say you might be looking at around three weeks to a month for one to be built – but it may well be longer if I’m inundated with orders. If you’re OK with this though then please click the button below. What I will say is that I’ll work as many hours as possible over the coming weeks to get the pedals out as quickly as I can. For my friends / potential customers in the USA / Australia / Canada etc. – I am aware there will be duty to pay when you receive the pedal. I am informed that for the USA it should be around 4.7% plus a small handling fee. I will fill out all the relevant forms over here to help speed the pedal through customs, but any import duty that’s payable is solely the customers responsibility. Pretty much the same as when I order from the USA I guess. Sorry to say that the initial run of 50 pedals is now sold out! Stay tuned for more announcements!